Leeds claimed their third successive league win as two second-half goals defeated fellow mid-table Wolves. 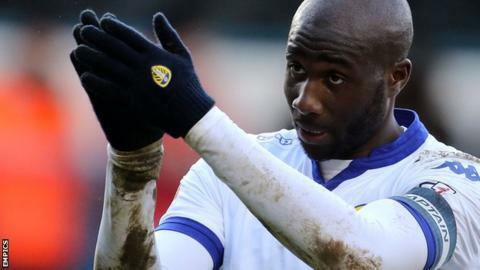 Defender Sol Bamba opened the scoring with a superb 25-yard volley yards after Wolves failed to clear a cross. Toumani Diagouraga doubled the lead from 15 yards before George Saville gave the visitors hope with a low effort from the edge of the area. Jordan Botaka then hit the crossbar for Leeds, while Marco Silvestri denied Wolves substitute Joe Mason late on. Earlier, Chris Wood had four first-half chances to score for the home side, coming closest when he hit the post with a shot from 18 yards. It is the second time this season that Steve Evans' Leeds have registered three consecutive Championship victories, while Wolves have won only three of their past 17 league games. "I thought the second half was quite stunning. This is a Wolves team that are very well organised under a top manager. They don't concede chances let alone goals, yet if we'd scored seven in the second half it might have been deserved. "But Leeds being Leeds we concede late and have to rely on a big save from our goalkeeper, the one thing he's possibly had to do all evening. "I'm delighted. It's three good wins against quality clubs." Match ends, Leeds United 2, Wolverhampton Wanderers 1. Second Half ends, Leeds United 2, Wolverhampton Wanderers 1. Sol Bamba (Leeds United) wins a free kick in the defensive half. Corner, Wolverhampton Wanderers. Conceded by Stuart Dallas. Foul by Jordan Botaka (Leeds United). Stuart Dallas (Leeds United) hits the bar with a right footed shot from outside the box. Assisted by Lewis Cook. Attempt missed. Lewis Cook (Leeds United) right footed shot from the right side of the box misses to the left. Assisted by Gaetano Berardi. Dominic Iorfa (Wolverhampton Wanderers) wins a free kick in the defensive half. Hand ball by Liam Bridcutt (Leeds United). Attempt saved. Joe Mason (Wolverhampton Wanderers) left footed shot from the centre of the box is saved in the centre of the goal. Substitution, Leeds United. Liam Bridcutt replaces Luke Murphy. Attempt missed. Gaetano Berardi (Leeds United) right footed shot from outside the box misses to the left. Assisted by Stuart Dallas. Attempt missed. Liam Cooper (Leeds United) header from the right side of the six yard box misses to the right. Assisted by Stuart Dallas with a cross following a corner. Corner, Leeds United. Conceded by Dominic Iorfa. Jordan Botaka (Leeds United) hits the bar with a left footed shot from outside the box. Assisted by Chris Wood. Goal! Leeds United 2, Wolverhampton Wanderers 1. George Saville (Wolverhampton Wanderers) right footed shot from the centre of the box to the bottom right corner. Assisted by James Henry. Substitution, Leeds United. Jordan Botaka replaces Lee Erwin. Substitution, Wolverhampton Wanderers. Joe Mason replaces Björn Sigurdarson. Attempt saved. Luke Murphy (Leeds United) right footed shot from outside the box is saved in the bottom right corner. Attempt blocked. George Saville (Wolverhampton Wanderers) left footed shot from outside the box is blocked. Attempt missed. Dave Edwards (Wolverhampton Wanderers) left footed shot from the centre of the box misses to the left. Assisted by James Henry with a cross. Goal! Leeds United 2, Wolverhampton Wanderers 0. Toumani Diagouraga (Leeds United) right footed shot from the centre of the box to the centre of the goal. Assisted by Lewis Cook. Attempt missed. Adam Le Fondre (Wolverhampton Wanderers) header from the centre of the box misses to the left. Assisted by James Henry with a cross. Goal! Leeds United 1, Wolverhampton Wanderers 0. Sol Bamba (Leeds United) right footed shot from outside the box to the top left corner. Assisted by Stuart Dallas. Attempt blocked. Toumani Diagouraga (Leeds United) right footed shot from outside the box is blocked. Assisted by Stuart Dallas. Corner, Leeds United. Conceded by Matt Doherty. Attempt blocked. Stuart Dallas (Leeds United) right footed shot from the right side of the box is blocked. Substitution, Leeds United. Stuart Dallas replaces Lewie Coyle. Lewie Coyle (Leeds United) wins a free kick in the attacking half. Substitution, Wolverhampton Wanderers. Adam Le Fondre replaces Jeremy Helan. Corner, Leeds United. Conceded by Jack Price.